Extended versions and dance mixes had been around for years, but as we saw when a separate single of remixes of Michael Jackson's "Black Or White" charted, they were literally coming into their own in 1992. This week in 1992, the biggest band in the world got in on the act, with their latest single coming with a stand-alone remix CD single. In the UK, the remixes charted higher than the standard release, while in Australia, they no doubt contributed to the song's overall chart performance. For a third and final week, "Jump" by Kris Kross was the number 1 single in Australia, with two ballads waiting patiently below for their turn at the top. She'd almost reached the top 50 with debut single "Anchorage", but Michelle Shocked came nowhere near it with this lead single from Arkansas Traveler. Because the world needed another Kenny G... The pop/jazz saxophonist, who used to play in Richard Marx's band, got a little help from vocalist Joey Diggs on this smooth single. 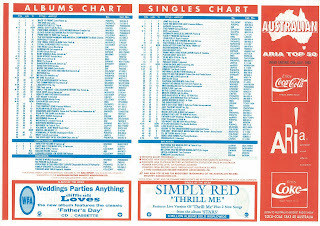 Its singles hadn't achieved anywhere near the success they had in the UK, but Simply Red's Stars album had enjoyed a healthy stay in the ARIA top 20. And so it wasn't really a huge surprise that this fourth single, which I never really liked that much, didn't even break into the top 100. What was interesting was that the appearance of "Thrill Me" here as Single Of The Week also didn't seem to help the album's fortunes, with it dropping down the chart the following week. "Ghost Of A Texas Ladies Man" had put them back in the top 50, but Concrete Blonde were going to have to do better than this tepid follow-up if they wanted to stay there (or ever hope to rival the success of breakthrough single "Joey"). OK, even I didn't really like this one very much. After two of the year's best dance hits (and it was only July), 2 Unlimited stumbled with their third single. A cacophony of techno beats and annoying synth sounds, it lacked the subtlety of "Get Ready For This" and "Twilight Zone" (and neither was particularly subtle), and opted instead for an angry sounding aural attack. "Workaholic" charted accordingly. After releasing seventh album Love Moves to general disinterest in 1990, despite it featuring a number of great singles, Kim Wilde had a bit of a rethink for follow-up Love Is. Instead of relying wholly on the production skills of brother Ricky, she enlisted the help of the hitmakers behind some of Belinda Carlisle's biggest songs: Rick Nowels and Ellen Shipley. The pair wrote this lead single, which certainly sounded like it could've slotted in to any of Belinda's recent albums, and Rick co-wrote and produced another two tracks on the album. The move worked - to an extent - with "Love Is Holy" giving Kim her biggest hit since chart-topper "You Keep Me Hangin' On" and her first top 20 single in the UK since 1988's "Four Letter Word". Unfortunately, despite the album again featuring some quality singles, nothing else did anywhere near as well and it'd take another cover version for Kim to really make an impression. We'd seen Aaron Neville on the top 50 alongside Linda Ronstadt on ballad hit "Don't Know Much" and almost again with his version of "Everybody Plays The Fool", but this was the first time he and his three brothers scored a hit. They did so with a remake of the Steve Miller Band song from 1976, which was the lead single from their Family Groove album, and featured Steve on guest vocals and guitar. This remains the highest-charting version of the song in Australia, with the original not having made the top 100 and Seal's 1997 cover for the Space Jam soundtrack only reaching number 81. And they were literally living in England, having decamped there to work on the follow-up to debut album All For One. That would come later in the year, but for the time being The Screaming Jets released this stop-gap EP, which, as well as the title track, included covers of songs originally recorded by Johnny Cash ("Folsom Prison Blues") and AC/DC ("Ain't No Fun (Waiting Round To Be A Millionaire)"). Despite this impressive debut, Living In England slid quickly out of the top 50. The original version was just fine - another good single from Achtung Baby - but the dance remix of "Even Better Than The Real Thing" was something else. A pumping club anthem courtesy of DJ/producers Paul Oakenfold and Steve Osborne (aka Perfecto), it gave the song a whole new energy. With its keyboard stabs and wailing female vocals, it was not what you would've expected from U2, but by retaining the guitar riffs and Bono's entire vocal, it still sounded like them. Besides, we'd gotten used to expecting the unexpected from the Irish band over the previous couple of years - and there was more of that to come. No prizes for guessing which version I preferred. Next week: brand new singles from two music superstars - one as raunchy as you'd expect, the other, not so much. I had forgotten that Michelle Shocked had another top 100 hit, but I don't think I've ever heard this one. 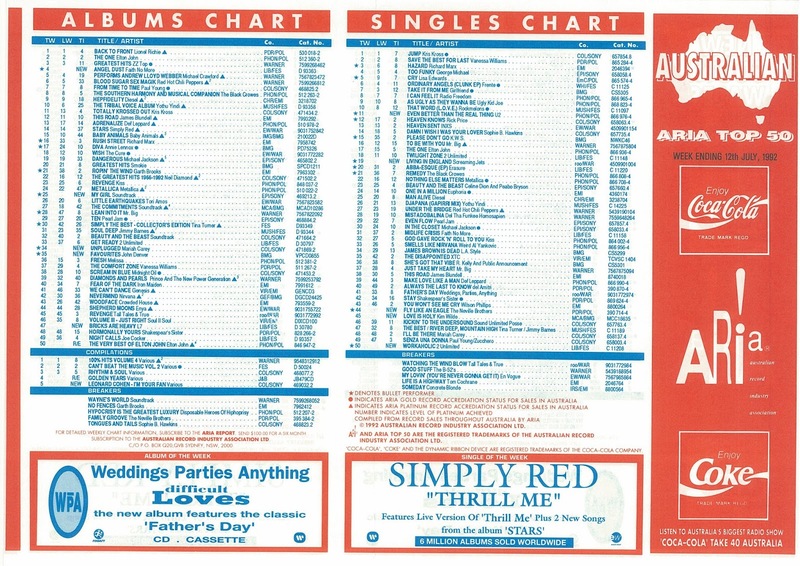 'Thrill Me' is a bit dull even by Simply Red standards, and charted accordingly. I'm glad it did at least chart though. It was fantastic to see Kim Wilde back in the charts. Whether 'Love Is Holy' was boosted by being a 99 cent CD single is a contentious issue, but I'd like to think it would have done well regardless. Concrete Blonde was another I bought for 99 cents at the time, and fared rather less well. I never heard anything from Michelle Shocked after 'When I Grow Up' (the follow-up to 'Anchorage'). I'm surprised this charted, though I remember reading an article on the parent album in the Brashs magazine. Pretty sure I've never heard of Dave Koz before. I don't think I've actually heard 'Thrill Me' before. I don't remember hearing 'Someday' at the time, either. I didn't hear 'Workaholic' until it entered the chart on rage. It's probably my favourite single from the 'Get Ready!' album. I had no idea Kim Wilde had a new single out, or that she was even still releasing them locally, until 'Love Is Holy' sneaked into the top 60 on rage. I suspect chart rigging was behind its ascent, evident by its swift descent from its peak, though it is a good song. 'Million Miles Away' from the album should have been a hit. 'Fly Like an Eagle' was another surprise (almost) hit. I remember thinking it sounded very similar (musically) to Vanilla Ice's 'Rollin' In My 5.0', which of course sampled the original. ARIA seemed to have decided to count both releases of 'Even Better...' as the same release for charting purposes, as I think they should have. Their earlier decision to count the 'Black or White' releases as separate was wrong, I think. I wasn't too fond of either version, and thought it was the weakest 'Achtung Baby' single. I had completely forgotten about the U2 remix. It was a staple of many trashy clubbing nights while we were at Uni. And you couldn't go to a StepReebok aerobics class without hearing it either (in your spandex bike shorts and hi-tops of course)... I agree with you 100%, as someone who couldn't stand anything U2, this dance remix was the sole exception for me!